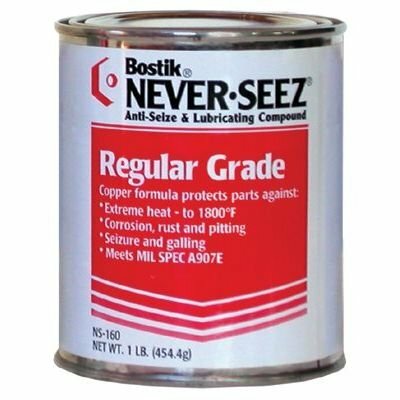 Never-Seez Regular Grade Lubricating Compound is a superior, anti-seize and extreme-pressure lubricant formulated to protect metal parts against rust, corrosion and seizure. Copper and graphite particles in special grease protect parts even in high-heat, high-pressure and corrosive environments. Engineered to keep parts working longer with less wear and enables faster disassembly when repairs are needed. Perfect for nuts, bolts, screws, pipe fittings, boom guides, valve assemblies, pump mountings, chain drives, machinery, taps and drills.